Well, we are in Tromsø, waiting for the nighttime so we can continue on our search for the northern lights, but first we have to wait for the sun to go down, which gives us time to explore and enjoy the Norwegian countryside. The photo below shows part of our journey along the fjord, approaching the sea and our destination, the island Sommarøy. The was a bit of surface ice when we started our journey, but as we approach the connection to the sea, the ice was not present anymore. We arrived at a hotel on Sommaroy, where we had a chance to sample a Norwegian waffle with jam and sour cream, which is the typical way to enjoy it. Umm, good! After our snack we put our parkas back on and zipped up for about a mile hike, or at least a little walk through the town on the fresh snow. Here is Resident Astronomer Peggy making her way down the path. We had a chance to wonder along the Norwegian Sea for a bit and have the waves come up to meet us. After our little hike it’s time to make our way back to the ship. The sun is down by now and we can’t really see much of the scenic sights. Back on the ship, we found a panel on the way to our restaurant dinner, which has a definite astronomical scene with the constellation Bootes and the star Arcturus down at the bottom. We have seen the moon just twice now on our cruise and have not seen a single star and only occasionally did we see the sun. There is a wide range of food on the ship and this night we elected to have dinner in the sit down restaurant, where you can order from a menu. Normally, if we had less time, we would have just helped ourselves in the cafeteria style cafe, but tonight after all that hiking (ok, ok, that might not be hiking for you, but it was a pleasant little “hike” for us) we just wanted to sit down and be served food and drink. After dinner we could see a few breaks in the clouds and hoped for a little bit more of clear weather. Sometime after 5:00 PM, we thought we could see some star in the distance. We had to look twice because we just a bit earlier had been fooled by some lights on the distant mountains, but this rime, we were sure it was a star. Yes, when looking at rhe image on the camera, we definitely we had definitely spotted a star. 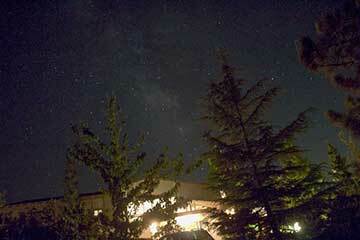 The skies were still cloudy, but I managed to get the following 10 second exposure with a 15-45 mm lens. The GoSkyWatch IPhone app, which I found is pretty reliable here in Norway, once the app has caught on to its new location. I used the app to guess that the bright star was Arcturus, but wanted to know for sure. So, with the help of the Wi-Fi feature on this new lightweight camera, I was able to download the image and then upload the image to some internet based astrometry software. Check out the astrometric determination of where on the sky the image came from. Yep, the bright star is Arcturus! Wow, Arcturus was the samestar we passed in the ships corridor. It’s pretty neat that the software is not confused by the clouds and eve; pulled some very dim stars out of the 10 second exposure. So, this little succes was incouraging, but the good luck was not going to continue. Before too long, way before any observable northern lights were expected show up, the clouds and snow came back to block any chance of seeing any lights, nor any more stars. So, we had to give up for the night. We setup our stateroom TV to enable the bridge crew to announce any possible siting of northern lights, but, as we assumed, not announcement was going to be made during the night. So, we got a full nights sleep and awakened in the morning mostly cloudy skies with some bright spots. We had a panoramic tour through the Tromsø neighborhood and there were giant piles of snow on every corner and open lot. Luckily, there are tunnels and tunnels with roundabouts u dear the city so it is easy to get around even when it is snowing outside. Again, the forecast for the coming night was for more snow, so we were once again faced with some coming disappointment. We at least had an opportunity to assuage our disappointment with a northern lights show at the Tromsø Planetarium. We saw some collected images and videos of northern lights on the planetarium dome. We still hope to see the real thing in our continuing journey.